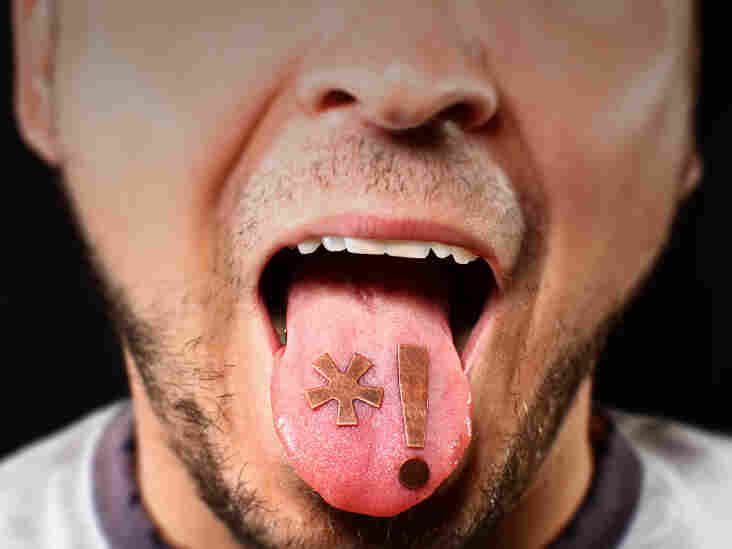 Swearing: A Long And #%@&$ History Middleborough, Mass., recently imposed a $20 fine for swearing in public. Linguist Geoff Nunberg says profanity makes hypocrites of us all. Sometimes it's small government you need to keep your eye on. Take Middleborough, Mass., whose town meeting recently imposed a $20 fine for swearing in public. According to the police chief, the ordinance was aimed at the crowds of unruly teenagers who gathered downtown at night yelling profanities at people, not just someone who slams a finger in a car door. But whatever the exact idea was, nobody thought it was a good one. The ordinance had the rare distinction of being denounced by Fox News commentators, the editorial writers at The Washington Post, and the director of the Massachusetts ACLU. There are some people who want to keep government out of the marketplace and some people who want it kept out of the bedroom, but pretty much everybody is spooked at having it police what we say to the neighbor who starts his leaf blower at 7:15 on a Sunday morning. But that's where the consensus ended, as the commentaries drifted off into culture-war faceoffs between moralists and modernists. To the moralists, the pervasiveness of swearing is a clear symptom of the collapse of civility and the coarsening of American culture. As they tell it, the dissolution began with the foul-mouthed demonstrators and hippies of the '60s and was amplified by Hollywood, rock music and hip-hop, turning us into a society that has lost all sense of shame or stigma. This is an old tune. Social critics in the 1940s railed at the unchecked profanity of the returning GIs. In the '20s they were lambasting the vogue for four-letter words among the society slummers called mucker posers, the well-bred young people who felt the need "to emulate the manners and language of the longshoreman," as one critic put it. And so on down to the Victorians, whose sermons and statutes were full of references to public profanity. But then as the philosopher Montesquieu observed, people have been complaining about the decline of manners and morals since the time of Horace and Aristotle. They couldn't all have been right, he said, or men would be bears today. The moralists are correct about one thing, though: This language has become more widespread and more audible than at any time since the early 19th century. I'd put the turning point in the '70s, when the styles and attitudes that emerged in the '60s were domesticated and divested of any subversive meaning — the moment when jeans, long hair and casual vulgarity became universal signs of democratic informality. But a modernist could argue that the ubiquity of four-letter chatter actually makes it less of a concern. In a piece criticizing the Middleborough ordinance, the linguist John McWhorter said that it's time to bring our sense of "dirty" into line with our modern come-as-you-are American spirit. True, there are one or two genuinely taboo words. But the rest of this language has gotten so ordinary that's it's not profane, merely colorful. Just make sure kids learn not to use it at inappropriate times, the same way they have to learn not to burp in public. That's the modernist point of view: Potty mouths are like potholes, just another of life's little inconveniences. They're there, they swear, get used to it. That uncompromising rationality may seem miles from the keening philippics of the moralists. Yet most of us slip easily between one position and the other. Just note the reactions when a political figure is caught dropping the F-bomb. To the opposition, it's gutter talk that shows his classlessness. To his own partisans, it's a "demonstration of earthy authenticity." And then when somebody from the other party uses the same word a week later, the two sides just exchange their copy. But each view has its appeal. The moralists have a point. Vulgar language may be a fact of modern life, but it's more troubling than potholes. It's infuriating to hear someone behind you in the movie line swearing energetically, even if you don't happen to have a 6-year-old in tow. In one recent survey, three-quarters of the respondents said that parents should teach their kids that "cursing is always wrong." But not a lot of parents teach that lesson by example. The proportion of Americans who claim they never curse runs anywhere from 5 to 15 percent, and you figure some of them must be telling the truth. But while the rest of us may officially disapprove of swearing, we also engage in it enthusiastically — and even, regrettably, at the family dinner table devant les enfants. You can't have profanity if there are no prudes left to be shocked by it. Well, profanity makes hypocrites of us all. But without hypocrisy, how could profanity even exist? To learn what it means to swear, a child has to both hear the words said and be told that it's wrong to say them, ideally by the same people. After all, the basic point of swearing is to demonstrate that your emotions have gotten the better of you and trumped your inhibitions. That's why the words have to be regarded as bad, not just inappropriate, so there's a real weight to using them. Swear words don't describe your feelings; they manifest them. Throwing the F-word at somebody isn't just a particularly colorful and emphatic way of saying, "I'm awfully vexed with you right now," any more than "Ow!" is just an emphatic way of saying, "Gee, that hurts." In the end, neither the modernists nor the moralists can ever win the argument. Each needs the other too much. The particular vocabulary items may change over time, but swearing itself can never become so ordinary that we no longer consider it naughty. You can't have profanity if there are no prudes left to be shocked by it. Let's give credit to the good people of Middleborough, Mass., for helping to keep the old traditions alive.